I am standing at the absolute edge of the world, or so it seems. Behind me lies the flat, roundup-country landscape of the Texas Panhandle-a windswept expanse of short-grass plains dotted by scrubby mesquite and gnarled juniper that stretches away to a blazing western horizon. 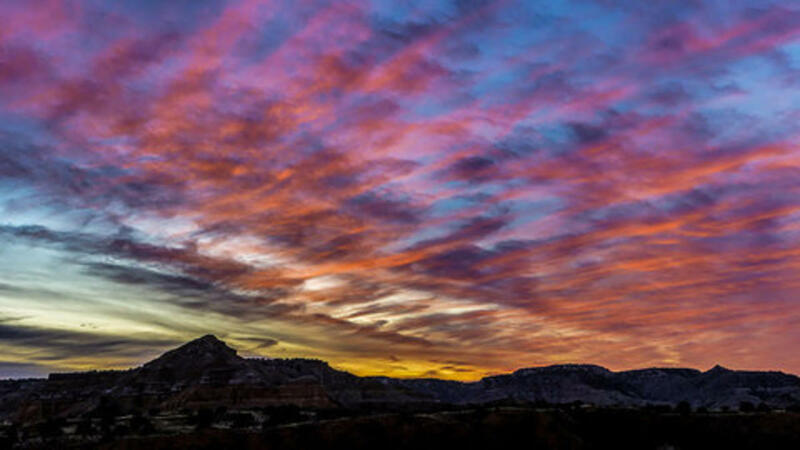 But at my feet, the huge Palo Duro Canyon yawns, a plunging drop-off into a vast rocky chasm, gypsum-cut sandstone cliffs, scrabbly hillsides green with sage and sumac, rocky columns and caves, all set afire by the rosy sunset over my shoulder. This is what artist Georgia O&apos;Keefe meant when she called this canyon "a burning, seething cauldron, filled with dramatic light and color." The canyon is just south of Amarillo, a lively town on famous Route 66 where the Old West saddles up to the new, much to the delight of travelers seeking an authentic Texas adventure with Southwestern flair. They belly up to experiences like the World Championship Ranch Rodeo, the enormous "Madame Queen" Texas-class railroad engine, the Big Texan Steak Restaurant, the Charles Goodnight Ranch House, the American Quarter Horse Hall of Fame and-for something completely unexpected-the world-class symphony that plays to sold-out crowds at the famous Globe-News Center for the Performing Arts. Second only to the Grand Canyon in size, Palo Duro ("hard wood" in Spanish) is more than 120 miles long and 20 miles wide in places. Beloved for its hiking, mountain biking, horseback riding, and even a summertime outdoor historical pageant, the canyon anchors a wealth of nearby outdoor public access sites. These include Lake Meredith National Recreation Area, popular with water sports fans, and Alibates Flint Quarries National Monument, where ranger-led, reservation only tours explore the flint quarrying and tool making practices of the prehistoric Clovis era. 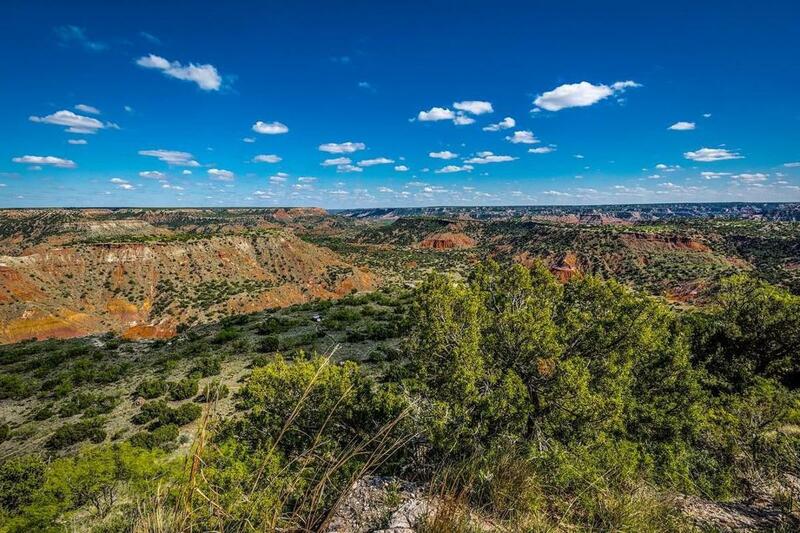 "People think the Texas Panhandle is nothing but a big flat plain, nothing between here and the North Pole but a barbed wire fence," laughs Nathan Londenberg, assistant superintendent at Palo Duro Canyon State Park. "And then all of a sudden the bottom falls out. Some people call it upside-down mountains." And of course mountains, even upside down, bring climbers. Take Jeremy Baughman, 22. "There is one climb called The Old Aid Route that follows an extremely thin right-leaning crack in a corner," said Jeremy, an Amarillo native. "The climb finishes at an old bolt and piton for the anchor." Unusual, considering the soft, crumbly rock common at Palo Duro, where free climbing is the norm. "In the canyon, you can&apos;t completely trust any small hold. It makes for a delicate and exciting challenge." So with chalky fingers thrust inside meandering cracks in the sandstone, toes pressed into fragile, nearly invisible depressions, do climbers even notice the bigger picture? Jeremy gets a kick out of this. "We absolutely notice the scenery. It changes so much with the weather and seasons. 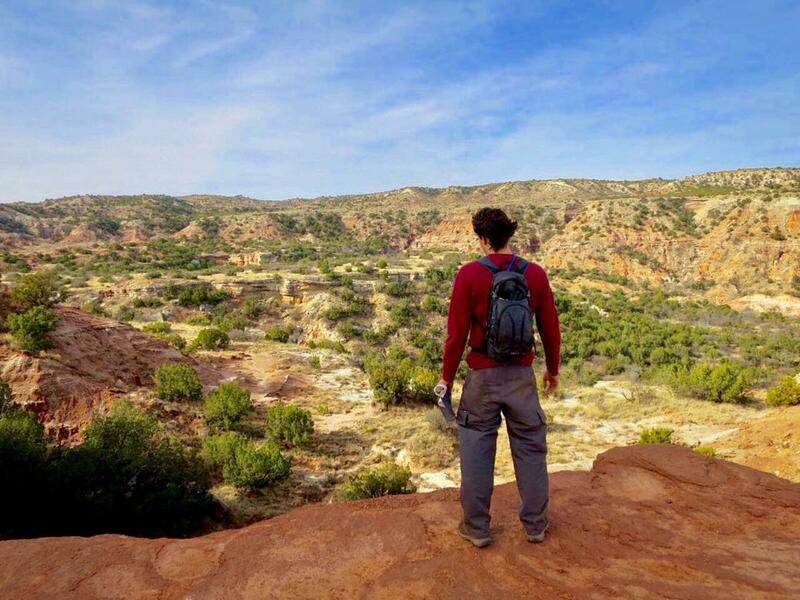 Palo Duro is a very quiet place where time seems to stand still." Dave Zallar is an import from the Midwest who stays as busy as the canyon is quiet. He hikes, takes pictures and for years has volunteered on trail crews. "Moving out west where the sun shines about 340 days a year and there are endless outdoor activities to participate in was the best thing I&apos;ve ever done," he says. "A person can spend a lifetime hiking, biking and camping here and each time discover something new." For example, Palo Duro uniquely features towering pillars of stone called hoodoos. "The harder capstone on top of the hoodoos is sandstone," Dave tells me, "which protects the softer mudstone from eroding beneath it." These stony Jenga towers right out of a Dr. Seuss book seem perpetually about to timber over full length to the dusty canyon floor. Occasionally, every million years or so, one does. To see the canyon&apos;s most dramatic hoodoo, the Lighthouse Peak, you scuff along a rocky trail over gentle rises and through sandy washes dotted with pencil cholla, big bluestem, star thistle and other sparse but hardy flora. Eventually you make a turn and wend your way along the base of cliffs laced with white bands of gypsum left over from long departed shallow seas. Flaring out to the trail&apos;s edge are some of the canyon&apos;s distinctive, dusty rose colored "Spanish Skirts" formations, conjuring images of twirling senoritas. A fairly steep climb at the end brings you to the base of the 300-foot Lighthouse Peak formation. Seeing it silhouetted against the vast, impossibly blue Texas sky above is definitely worth the hike. Technically, yes, it&apos;s a walk in the park, but officials recommend two quarts of water per person for the trip. Canyoneering is easier for Buzz Wills, aloft in the gondola of his hot air balloon "The Second Wind". Not that his first launch there, back in 1982, was smooth. Buzz was the first balloonist to launch over the canyon, so there was no one to ask for advice. The result? High-plains winds caught the balloon just before launch and dragged it right over the edge. "We probably fell 500 to 600 feet before we got buoyancy back into the balloon," he says, shock hollowing out his voice a bit, even now. Spoiler alert: It turned out OK. "It was really a special flight," he says, drifting away for a moment in a reverie. The most memorable part? "Oh, the color. As the sun came up over the edge, the shadows changing their color up on the cliff wallsâ€¦ Every time I fly, there&apos;s an aura out there. It makes you sit back and reflect on how beautiful it is." It&apos;s plain that the canyon-and the Amarillo area generally-offers something different, something unusual, but something accessible, too, that sneaks into visitors&apos; minds and hearts and changes them, making them want to take big steps and do the big things that others may shrug and take a pass on. A perfect example is Shirley Riggins, a Memphis, Texas, native but long a resident of Amarillo, or "Am-rilluh", as she and other locals call it. She&apos;s spent decades camping between the walls and walking the trails with her family. "My kids were kinda raised down there," she chuckles. They&apos;re grown and flown now, but still busy climbing the mesa walls in her memories, which she shares in a husky Texas drawl that is part high-plains Lucille Ball, part Panhandle Paula Deen. She describes hiking the Paseo Del Rio trail, where the landscape, the Spartan but tersely beautiful vegetation of the arid Southwest and the plentiful canyon creatures always delight. "You never know what&apos;s gonna run across the path in front of you," she laughs, ticking off some examples. "A diamondback rattlesnake, a raccoon, rabbits, fox, coyotes, tarantulas." In fact, the unanticipated is the daily routine at Palo Duro Canyon. "If it&apos;s raining, you&apos;re going to get a completely different view altogether. If it&apos;s snowing, you&apos;re going to see things you never expected," she said. "It depends on the light; I see things that I&apos;ve never seen before and I think, "Now, how did I miss that?&apos;"
After years of visiting, Shirley volunteered as a Canyon Host. There is just too much astonishment, joy and wonderment on tap in the canyon to keep to yourself, she decided. "You&apos;re sitting there and all of a sudden you hear the coyotes, and it seems like they&apos;re right under your window," she says. "Or you can be sitting at your campsite and you&apos;ll have deer and turkeys just walk right up. Or you&apos;ll hear a baby fawn bleat. Things like that kind of stick with you." No doubt. But so do the conversations I&apos;ve had with the people who make Amarillo, the Texas Panhandle and the Palo Duro Canyon area their home, who explore its every box canyon, burrow and butte only to find in the end they&apos;ve accidentally discovered themselves. They aren&apos;t reluctant to share with outsiders the same opportunity. It&apos;s an experience not to be missed, and really only available in and around Amarillo. After all, I can buy snakeskin boots in the concrete canyons of Dallas, or a nice Stetson in oil-slippery Houston. 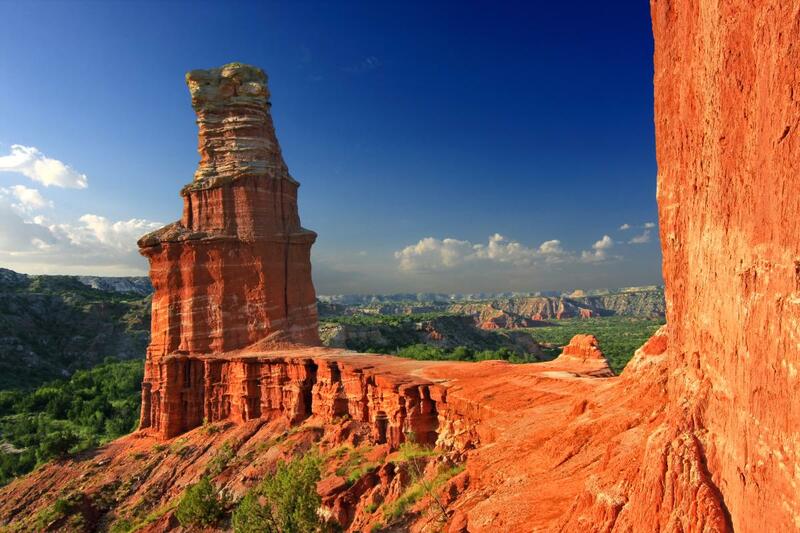 But when it comes to authentic Texas, Amarillo and the Palo Duro Canyon are as real as it gets. Discover more Old West flavor and adventure in Amarillo.